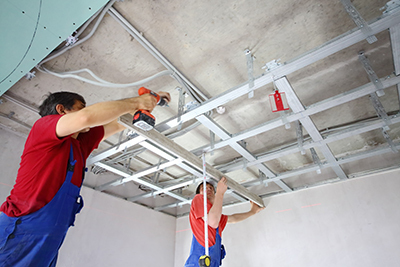 Drywall finishing is commonly for professionals to do, since the process is not as simple as it seems to be. It is even considered an art because it takes time and skills to master. The finished drywall varies depending on the type of mud and tape used, as well as the application technique. The smoothest one is said to be the level 5 finish. It involves skim coating of the entire drywall surface. Finishing comes in various levels, but level 5 is used when there is a need for critical lighting and the use of high gloss paint. 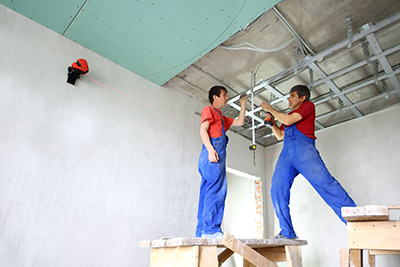 The goal of finishing a drywall is to get the surface ready for wallpaper or painting, to make joints disappear so the ceiling or wall are perfectly smooth. Professional drywall contractors have mastered proper finishing techniques. They know the challenges they are about to face and are ready with the necessary solution. Choosing to do the task yourself may get you to lower your standards. It is necessary to follow steps, and avoid skipping one, in order to get more positive results. The steps include drywall preparation, materials selection, tape and compound application, and sanding. Before taping, it is best to check for under driven nails and screws. This is done by professional drywall installers by sliding a knife across fasteners. This is a common problem that occurs on corners, and of course, they simply drive screws using a screw driver. It is also important to tap nails below the face of the drywall. For this, a special hammer is used, but a regular one is also suitable if a pro does it carefully. Before taping, an expert installer trims away loose and torn paper using a knife. It is cut away from soft spots where the drywall is crushed. The compound strengthens these areas, which is necessary to prevent problems in the future when the torn paper causes babbles. A stain-blocking primer is sprayed to solidify loose papers. Drywall companies also use setting compound for faster drying time. They leave a gap along flanges for the compound. A single bead length is used for every corner. A setting compound is ideal for it hardens rapidly and does not shrink. Taping follows immediately before the compound hardens. This is bought in powder form and mixed with water, and is available in sandable, 20, 45 and 90 minute hardening time.